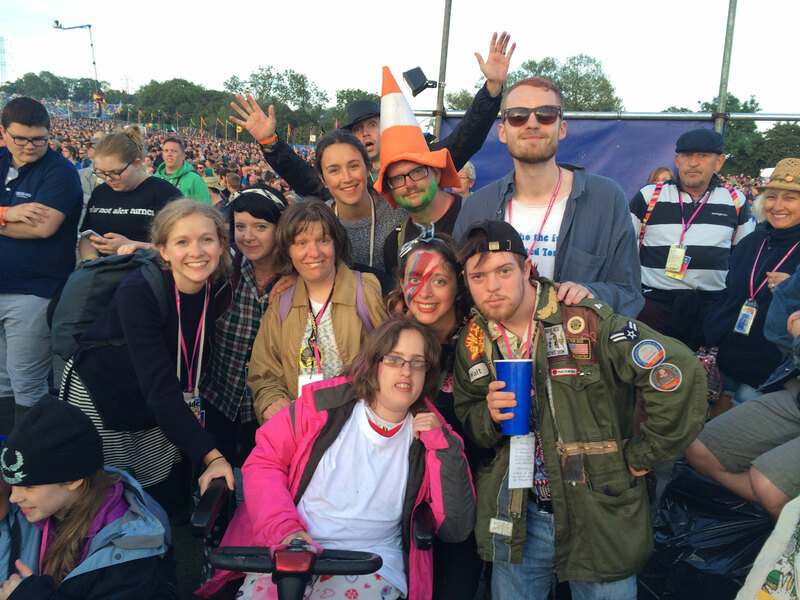 Ang and Kittie are a Gig Buddies participant and volunteer and went to Glastonbury Festival this year. This is a conversation between them about the experience. 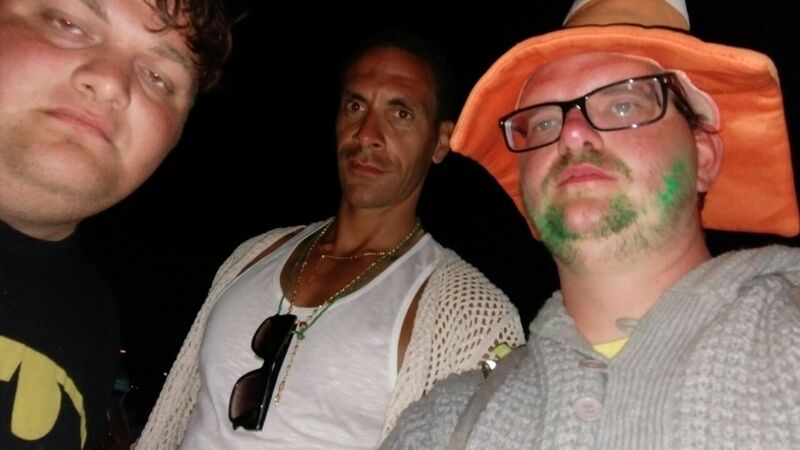 Their first ever trip to Glasto. And what a trip it was…! Ang had never been to a festival before. She explained that she would never have thought of going to Glastonbury or any other music festival if Gig Buddies hadn’t of asked her. 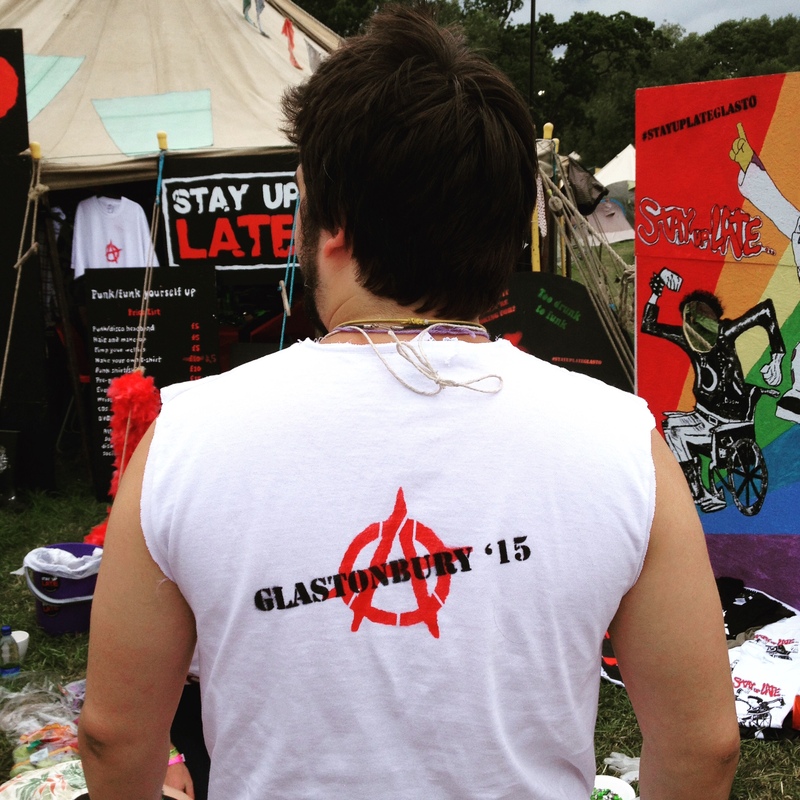 “I would go again, now that I have been to Glastonbury because I really enjoyed it”. Ang – Getting pissed and seeing Burt [Bacharach – Raindrops keep falling on my head – Luckily this didn’t happen too much this year at Glasto!] Also getting stuck in the woodchip because a really cute guy helped clear my wheels! 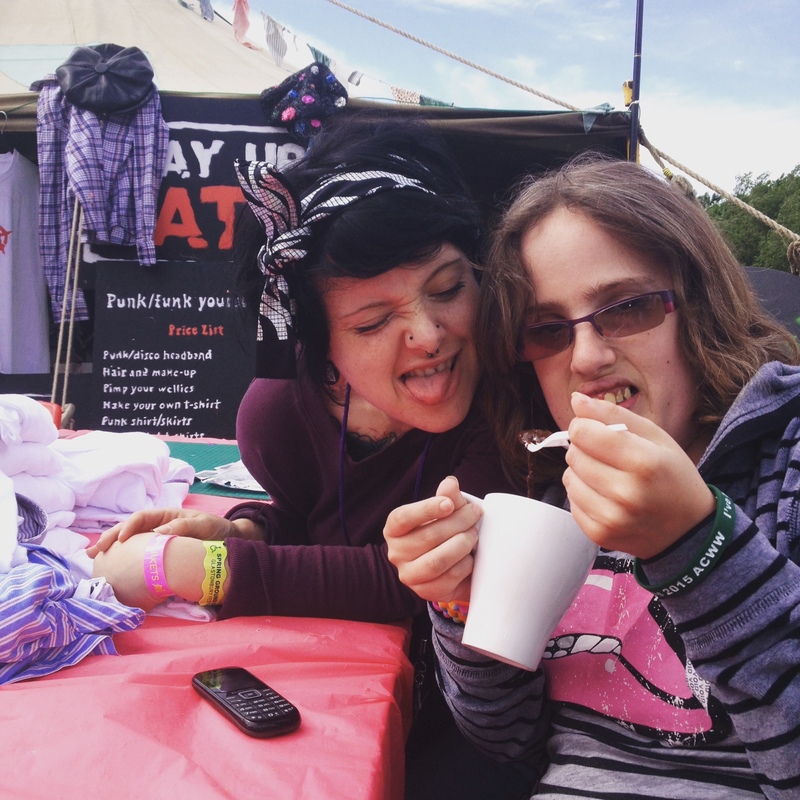 Kittie – I loved hanging out with all the buddies, volunteers and Gig Buddy staff. I got to spend 6 days with some amazing, funny and energetic people who made me remember how fun life can be! 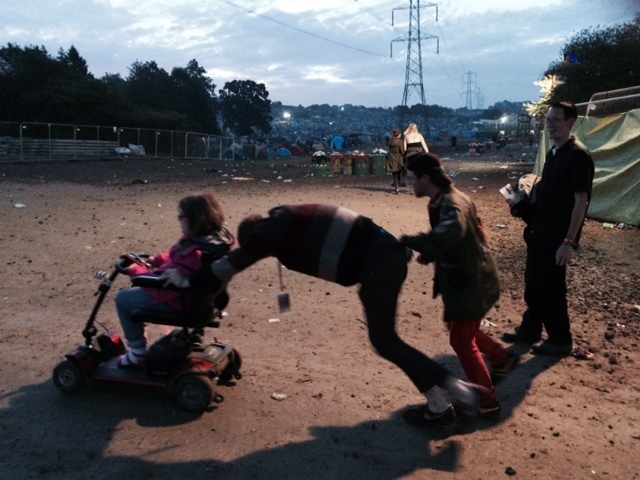 My favourite bits were when everyone found their way to the Pyramid stage at the end of the night to meet up. Ang – The portaloos! After a day they f**king stunk! They were gaggish! 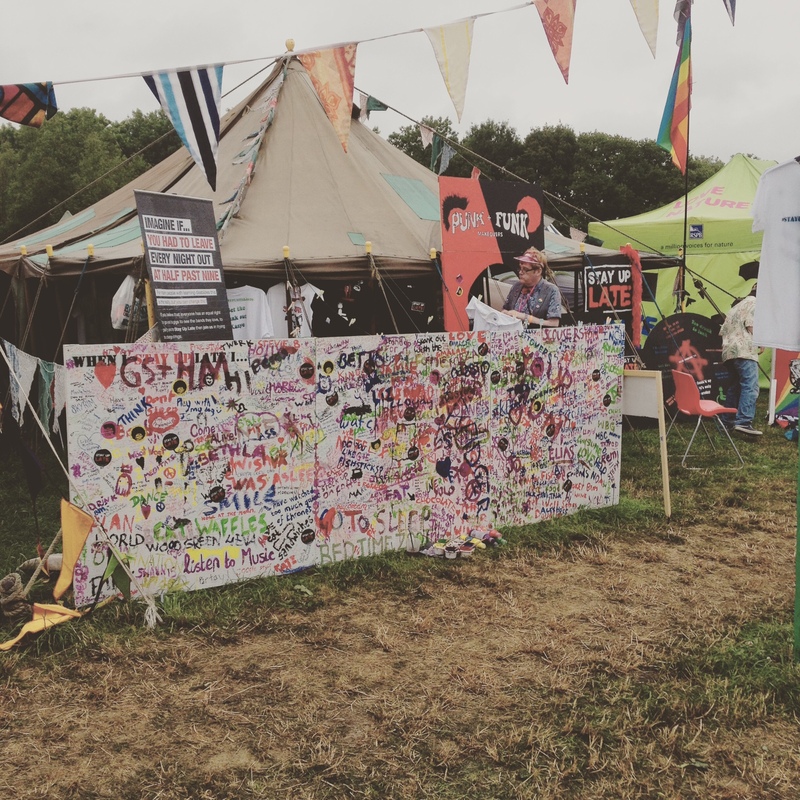 Kittie – Taking the tents down and realising it was time to go back to real life! I loved waking up in the tent, hanging out with Ang and the others and punking people up and listening to live music all day. I wasn’t ready for it to end. The festival come down was EPIC. Ang – Hozier was good [That looks tasty, that looks plenty, this is hungry work, Take me to church!] and Paul Weller was good too [You do something to me, something deep inside]. Paloma was a bit weird, she looked a bit weird [Her name was New York, New York, and she took his heart away!]. Florence was good [You got the love!]. And Burt was great, [cue more raindrops]. Kittie – Kanye, why exactly are you in that crane? He told us there was 7 minutes left… longest 7 minutes of my life. And Franz Ferdinand and Sparks… Just not that good. Did you see any famous people….? Aria Stark from Game of Thrones.. . she was so tiny, Alexa Chung, Rio Ferdinand, Lewis Hamilton and some people saw Kim Kardashian…. And we went with Bernie who looks just like Elton John but cooler. Apparently the Dalai Lama was there…. but we didn’t see him…. did we? I don’t even know what he looks like so we might have seen him?! How did we get there….? We got to Glastonbury in a very cosy Peugeot driven by the wonderful Kate. Kate, Kittie, Ang and Bernie in the car along with a wheelchair, massive cooking pots, bags of food, stuff, lots of stuff and the Stay Up Late banner. After a little while we couldn’t feel our toes in the back…. what toes? It was a bit of a squeeze but a very fun squeeze and gave us a chance to get to know the people we would be doing makeovers with. We drove past Stonehenge… a little bit of culture en route. Ang didn’t realise how far it was and the drive took a little while. On the way back it was the party car! An overheating party car! So we had the windows down, the heating on full whack with an amazing dance album that Ang picked to keep us all awake and having fun! We were definitely having more fun than all the cars around us… the many many cars around us… in the stand still Glastonbury traffic! But it gave us a chance to get out and stretch our legs! Bernie – He was doing the makeovers and making bow ties galore! 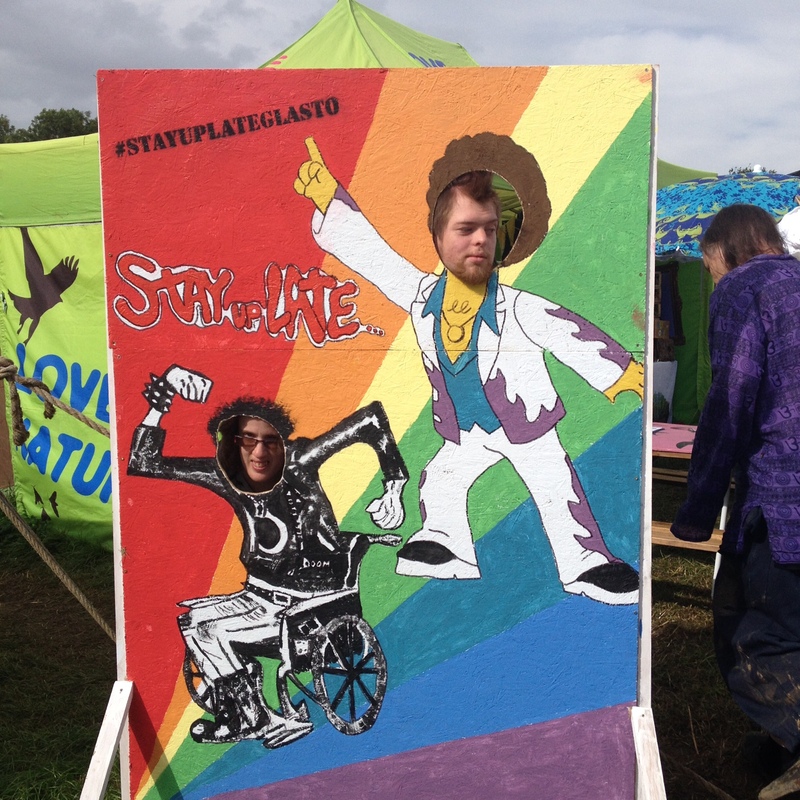 Sian – She was Ang’s wine buddy, at Glasto and beyond! Kate – Perfect timing for middle of the night toilet trips. And the best chauffeur around! Paul – He had the best face paint action! Claire – She was a human horn for Ang’s scooter. Sam – The ginger one, he was hanging out with Luc and was the best at spray painting. Chris – With his cone hat and old man face mask he was scaring lots of people! David – He had an Ainsley Harriott mask for some of the festival! The rest of the time he stewarded and found lots of interesting hats! Imogen – Is the reason Ang got a massage Sunday morning, so thank you Imogen! Kiera – She was a busy lady! Kittie and Ang – They were the best ones… of course. If you use a wheelchair and you have a manual and an electric – take them both!! Take toilet roll. Lots and lots of toilet roll. Don’t breath in the toilets without your nose covered up! Always take painkillers. For the morning after. Take lots of wine – it’s better to be safe than sorry. Never try to drink the last bit of wine out of the bag, unless you are very careful, [Choking hazard]. Baby wipes are an essential item. Especially when it gets muddy! 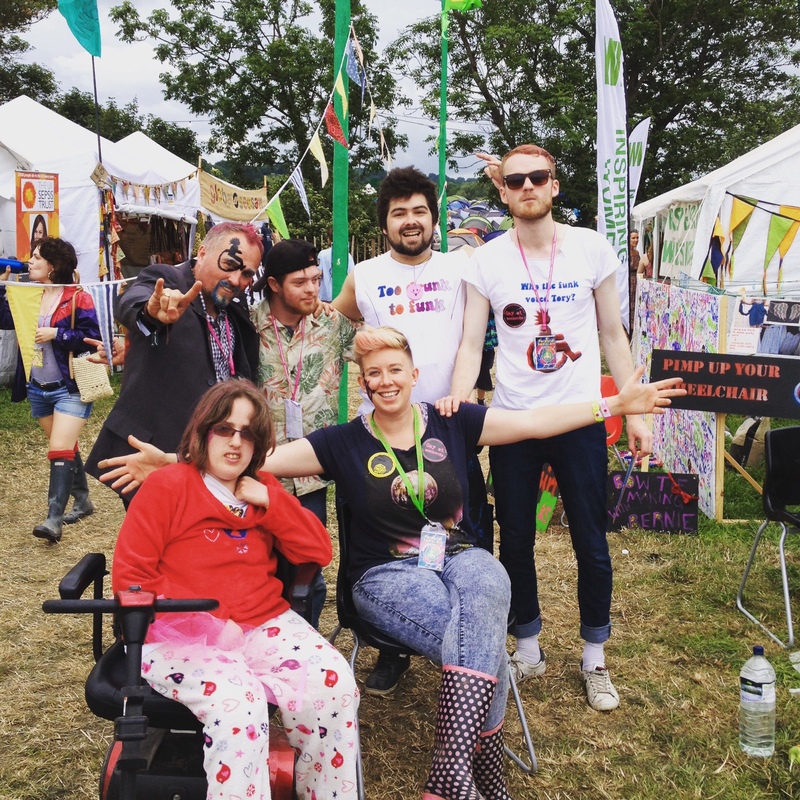 Ang’s final thought – If you want to go to a festival and you haven’t been before you might want to try a smaller one to start with if you get overwhelmed easily. I wasn’t expecting it to be that big! Kittie’s final thought…. There was a point on Friday when both of us were not sure we wanted to be in that muddy field, a little hungover and far away from home. But we stuck with it and ended the festival feeling very different having met lots of great people seen lots of great music, had loads of great chats and a bloomin marvellous weekend!